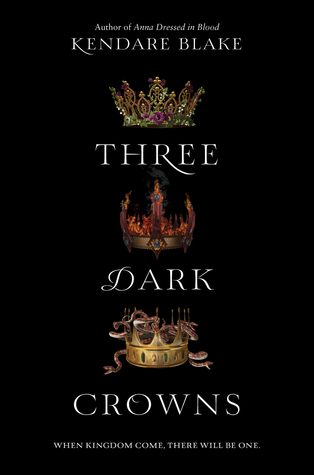 Three Dark Crowns by Kendare Blake. HarperTeen, 2016. Hardcover. 416 pages. This review is so difficult for me to write because I have so many feelings that are a mixture of both positive and negative (though overall, I feel good about this book!) A majority of me completely fell in love with this book and cannot wait for the next one. However, there is a small part of me that was somewhat confused and annoyed by various minor aspects. From an entertainment and overall plot standpoint, Three Dark Crowns is a solid winner. This is an exciting journey that is rather twisty in nature, and I loved reading it. However, from a closer and more detailed look, there are a few areas that I had some issues. The biggest one was with the distinction (or lack of) between the sisters; I initially - and a few times throughout - had trouble distinguishing between the sisters' perspectives. Yes, I know it is obvious who is who based upon where they live and what their special gift is, but personality-wise they all seemed so... similar. They all acted fairly sweetly and seemed somewhat 'innocent,' and it wasn't until much later in the story that I felt like I could really start to tell them apart, though I felt Katharine and Mirabella shared many traits. This problem is partly what made it take me so long to become fully immersed int he story. I was also somewhat confused about Jules' character. I could never truly figure out what her role was: why was she so prominent? Why was their an additional character that we focused on in Arsinoe's world perspective and not int he other sisters' Maybe this will be answered more in subsequent books, but I'm just not sure right now, and it just felt like this underlying question that was never fully answered. It almost made Jules seem like a more important character than Arsinoe, which certainly can't have been the intended goal? Regardless, I still enjoyed Jules' character - she was strong, entertaining, and I also loved Camden. I loved the blend of romance, action, political-esque intrigue, and overall culture and world building that made up Three Dark Crowns. It just felt like a perfect amount and mix of every single one of these elements, and Blake did a wonderful job of incorporating them all within this story. I've also seen some people complain about a lack of action in this book, but to be completely honest, that didn't really bother me. I felt that there was sufficient action; however, I am also not huge on action - too much action in a book often bores me, so I appreciated the more political and behind-the-scenes types of action that went on. I enjoyed the developments between characters and alliances. Lastly, I feel as though I was slightly led astray regarding the actual plot of this book, as I assumed this book would be focused on the actual event in which the queens attempt to kill each other. Instead it was more about the preparation leading up to the 'event'. I was also unclear on how the final 'ascension year' would really work, too - is it Hunger Games-style where they are put into a ring and may the best woman win? Or do they continue living in their own lands and subtly try to murder one another? Honestly, I'm still feeling a bit fuzzy on the details, but I'm hoping the next book will straighten everything out. I know that based upon what I have been saying in this review it might sound like I didn't enjoy Three Dark Crowns that much, which isn't true at all and why this review was so difficult to write. I had so much fun reading this book! I looked forward to picking it up everyday. Despite the many flaws, it still makes a wonderfully exciting reading and Blake's writing is extremely strong when it comes to plot and suspense. I definitely recommend this popular book, and am giving it four stars! I do love a good time travel story. Glad you wound up enjoying this one, Jordan. It's been one I've had my eye on for a while, and in fact, I *almost* bought it the other day. The kind of reviews you have to REALLY think about and consider are hard, but it's nice to know the end result was worth it.